If this is a last hurrah, it's not what the name Rainbow deserves. 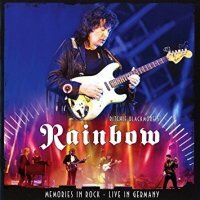 hen Ritchie Blackmore confirmed three Rock shows, there was excitement and speculation about a Rainbow reunion of some sort. However, when the line-up of bassist Bob Nouveau and drummer David Keith from Blackmore's Night, keyboard player Jens Johanssen and Lords Of Black vocalist Ronnie Romero was revealed, that excitement quelled somewhat. In fairness, Blackmore described the shows to Fireworks as "putting a band together to play old songs" – he didn't call it Rainbow but for obvious reasons it was promoted as that. If you were confused as to what this band is beforehand, that is only compounded by the use of the 'Over The Rainbow' intro tape which has kick-started so many great Rainbow shows... only for them to go into a strange rendition of Deep Purple's legendary opener 'Highway Star' which omits the signature percussive build up in favour of a stop-start vocal from Romero. 'Spotlight Kid' follows suit in sluggish fashion before the band hit their stride with an impressive 'Mistreated'. The vocalist manages to sound a bit like the great Ronnie James Dio on 'Sixteenth Century Greensleeves' before momentum is quickly lost on a lackluster rendition of 'Since You've Been Gone'. Unfortunately, throughout the show the drums and bass, while competently played, have no bombast to them. When Blackmore solos, there are huge holes in the sound as the rhythm section sounds extremely thin. The second problem is that Blackmore's wife Candice and Lady Lynn (on backing vocals) are virtually inaudible. This is a serious drawback during 'Child In Time' which doesn't work very well as the highest screams are clearly too much for Romero and where he would have certainly benefitted from some vocal help. After a limp 'Perfect Strangers', Romero handles 'Stargazer' very well but the weak percussive sound strips the epic of its much needed thunder. There are some moments of magic, but ultimately it does sound more like Blackmore and some guys playing old songs than Rainbow. If you were there, the atmosphere and nostalgia would have made it a great night. However, viewing this as a live document bearing Rainbow's name, I take issue with the lethargic tempos, the rhythm section, the amount of DP material and I'm frankly not convinced by the choice of Romero either. Hopefully there will be more shows to address these points because if this is a last hurrah, it's not what the name Rainbow deserves.